An Accurate Map of North America, Drawn from the Best Modern Maps and Charts and Regulated By Astronl. Observatns. This is a curious little map of North America. Covers the whole North America as well as parts of Europe and South America. This is a pirated 1797 reissue of Bowen 1747 map of the same name. Wheatley seems to have stolen the map and updated it solely by scratching out Bowen's name from the title cartouche. Nonetheless, this map is cartographically interesting with much to recommend it. 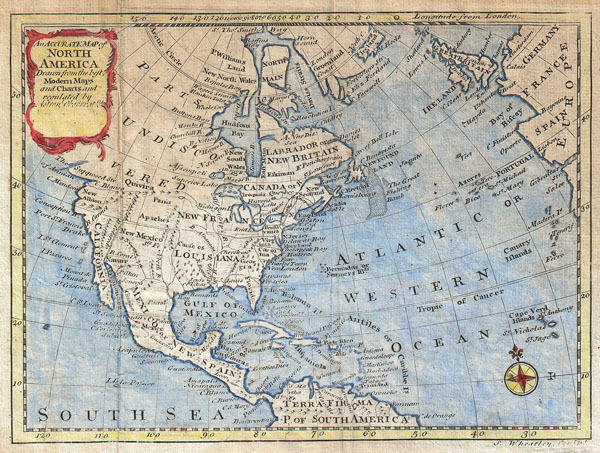 Shows North America in Colonial times with a misshapen Florida and California. Lists the Apache Indians and the 'Supposed Strait of Annian.' Anian is a term derived from a John Donne poem, 'Anyan if I go west by the North-West passage.' However, it was interpreted as the Bering Strait by cartographers, successfully transitioning it from the realms of poetry to cartography. Anian presupposed the existence of a Northwest Passage and, as such, was entirely mythical, though the lands that are now Alaska long bore that name. Further south still we find Quivira, one of the legendary northern American Kingdoms of Gold. Much of Modern day Canada is labeled 'Parts Undiscovered.' Includes the Fishing Banks off Newfoundland and offers fairly accurate details of the Caribbean. Prepared by Wheatley for D. Fenning's 1797 issue of A New and Easy Guide to the use of Globes; and the Rudiments of Geography. .
Samuel Wheatley (fl. c. 1744 - 1763) was a Dublin based engraver active in later part of the 18th century. He operated his engraving business from the shop of an ironmonger known only as "Mr. Costigan", in Salutation Alley, Dublin. His is known to have engraved maps for Faulkner's edition of Sale's Universal History and Smith's History of Waterford. He also seems to have made a map of Lough Neagh for Barton's "Lectures on Natural Philosophy. Though is described by contemporaries as an "Engraver of Note", he seems to have had no qualms about blatantly pirating the work of others. He died in 1771. Little else is known. Good condition. Original folds. Age toning. Minor water stains. Contemporary color. New York Public Library, Map Division, 1258748. Phillips (North America), page 595.